Westside Quilters is a nonprofit corporation whose purpose is to promote both educational and charitable endeavors among its members. To encourage our members to offer the results of their considerable talents to help others the database of charitable opportunities below has been created. This list will be added to as we find more ways for our members to serve the community. For more information or to offer more suggestions, contact our Philanthropy Chair at Philanthropy@WestsideQuiltersLosAngeles.org. 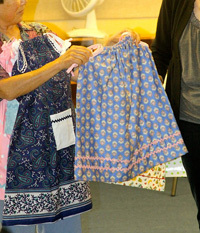 The Westside Quilters Annual Philanthropy Workshop "Giving For Thanksgiving"sewing day. Join us on Saturday, November 10th at St. John’s Presbyterian from 9:30am-3:30pm. for a day of fun, food and philanthropy! Please come for the day or stop by for hour or two. Bring a machine or just yourself. We will be having a potluck lunch so please bring a food item to share. We will provide paper products, plastic ware, coffee, water, and a dessert or two. Everyone is welcome whether you sign up or not. Thank you to the members have continued to make the strip blocks. We have quite a few blocks returned. Please continue to bring any completed blocks or quilt to the November 10 Philanthropy workshop. We are already off to a good start having collected over 20 quilts, numerous knitted hats and scarves and receiving blankets. We are looking forward to completing more projects at the November 10th workshop and are looking forward to making deliveries to A Child’s Dream and Upward Bound before Christmas of this year. If members have larger pieces of fabric to donate suitable for quilt backs it would be greatly appreciated. Batting would also be appreciated. If you have children themed fabric, this is also a good time to use it for receiving blankets. If you have quilting pins to spare, please bring those too! Upward Bound Family Place Upwardboundhouse.org is an outreach program connected to United Methodist Church in Santa Monica which helps families transition from homelessness into shelter. Their families would appreciate quilts in all sizes, but would especially appreciate twin or larger size quilts. Dollies Making A difference is a 501(c)3 non-profit community of women based in Pacific Palisades who create one-of-a-kind handmade Dollies and colorful Teddy Bears each wrapped in a small quilt for children all over the world who are in need of something special, made just for them with love and compassion. More information about the organization is available at dolliesmakingadifference.org and in this article from the Palisades Post. 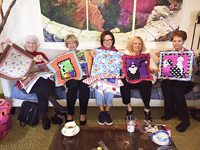 Westside Quilters can contribute by making small fabric quilts or knit or crochetd blankets which are wrapped around each Dollie or Teddy Bear. Each finished quilt is approximately 16”x16” consisting of a top and back. Batting may be used but is not required if you are using flannel. The quilts can be any design and appropriate for boys (with teddy bear) or girls (with dollies). Below are some sample ideas. 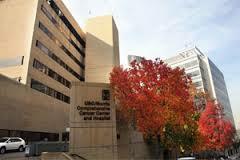 The Norris Comprehensive Cancer Center is seeking donated quilts to be given to their grieving families in the time of their family member's passing. 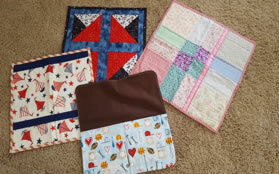 With each quilt their goal is to provide their families with the compassion and support they need during such a difficult and grieving time in their lives.The quilts will be a remembrance of the person to whom they are saying goodbye. One quilt will be laid across the foot of the bed of the passing patient for comfort. The families will then take the quilt with them after leaving the hospital. 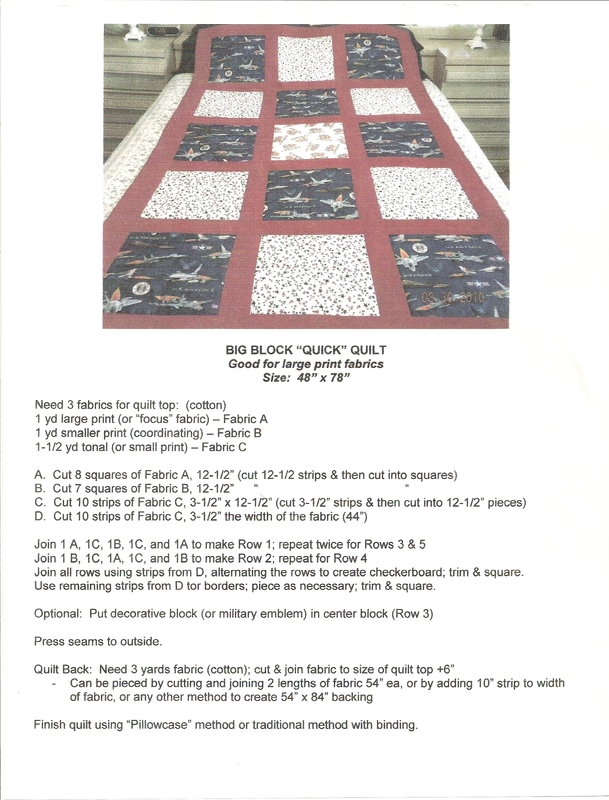 The quilts can range from 30" wide X 50" long or 40" wide X 60" long. 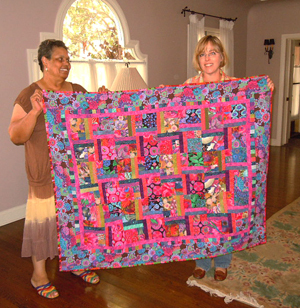 Quilts can be delivered to the Norris Comprehensive Cancer Center or mailed to the facility at 1441 Eastlake Ave., Suite 1335, Los Angeles, CA 90039. Contact Priscilla Marin at Priscilla.marin@med.usc.edu to arrange a delivery time or for more information on the Center. Las Familias Del pueblo is a 501(c)(3) organization - a community center in a converted one-room storefront for sweatshop workers and their families. Las Familias serves more than 500 families a year. There is an after-school program for about 100 children, English-as-a-second language classes, a weekly legal clinic for work-related problems, and assistance with whatever needs for the mostly immigrant families. The center has a kindergarten/first grade charter school that provides a full-day, academically challenging curriculum to some of this city's most educationally-at-risk children. Las Familias is located at the edge of skid row and the start of the Garment District. Para Los Niños Means “For The Children”. Para Los Niños is a nonprofit organization that has worked for more than thirty years to create academic success and social well-being for children. Through early education centers, charter schools, and wellness centers, we offer high-quality education integrated with family supports, mental health services, and community engagement opportunities to thousands of children living in at-risk neighborhoods in Los Angeles county. Para Los Niños would like to receive quilts that are 36” by 46” for the child care center. Quilts that are larger are very welcome and will be given to needy families and their children. There are no size requirements for quilts that will be given to Para Los Niños families. Little Dresses for Africa is a non-profit 501c3, Christian organization, which provides relief to the children of Africa. Simple dresses are made out of pillow cases or cotton yardage, and distributed through the orphanages, churches and schools in Africa to plant in the hearts of little girls that they are worthy! These are very easy and fun to make. Here are the instructions courtesy of Nancy's Notions. BABY/CRIB QUILTS FOR ST. JOSEPH'S EARLY LEARNING CENTER. The Center provides intervention, prevention and educational services to needy families and individuals on the Westside of Los Angeles. and is considered “one of the pre-eminent social service organizations serving low-income members of the Westside community” by The California Community Foundation’s Donor Connect newsletter. They provide enriched childcare and parent education services that nurture children’s healthy development while promoting stability and self-sufficiency for their families. 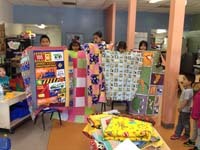 There is a need for quilts for kids at the Learning Center. Quilts should be made from washable materials, be quilted or tied. Since the center services low-income and homeless families, other sizes of quilts would also be welcomed. Quilts should be delivered to WSQ Philanthropy Chair at the general meeting or may be picked-up or dropped-off by prior arrangement. The Wounded Warrior Program ships quilts directly to Combat Hospitals in Afghanistan and Iraq for critically wounded Military Personnel (Wounded Warriors). They are transported from combat areas on stretchers inside converted cargo planes with minimal heating. The quilts donated are also used as part of patient care in the Intensive Care Units. Handmade quilts provide warmth, comfort, color and softness to their surroundings and show our gratitude for their sacrifices. 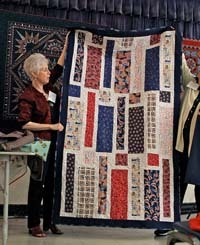 Design: Any quilt pattern in appropriate patriotic colors and themes. Here is one suggested pattern. For more check out the WQ Show and Tell pages! Pillowcase: Please include a pillowcase in a coordinating fabric to match the quilt (20” x 30”); used to contain quilt for shipment. Pillowcase Pattern. Delivery: WQ requests that the quilts be brought to WQ Quarterly Meetings for “Show and Tell”. 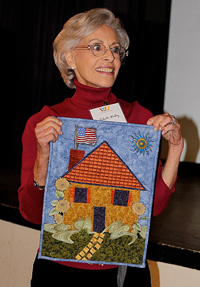 WQ will coordinate deliver of the quilts to Arlene Zobrist, Blue Star Mother, South Bay Coordinator. The Santa Monica/Westside YWCA provides a Transitional Housing and Education Program for eight (8) young woman, between the ages of 18 and 22 years, who are former foster youth. They are provided with a home, food, social support and services for up to two and a half years while they attend school full-time, work part-time, save for their future and attend life skills classes. Quilting: Machine quilting, hand quilted or tying accepted. Label: Appropriate label containing quilter’s name, date made and an expression of a successful transition to Independence. Furnishing Hope, a non-profit organization that provides the interior décor/furniture for Habitat for Humanity Wounded Warrior Battalion from Orange County to San Diego. This is an ongoing project that furnishes four homes a month for wounded US Soldiers coming back from Iraq and Afghanistan. Size: 12” wide by 16” high in vertical format. Delivery: Share finished project at WQ Quarterly Meetings and deliver or mail to Jamie Fingal. Contact her at Jamie.Fingal@gmail.com for mailing information. Flannel top and flannel backing. Flannel should be washed before sewing. For the top Keiko usually uses 6" squares, but any pattern is acceptable. Batting of 80% cotton and 20% polyester - relatively low- loft. 2. Sew a 1/2 inch seam allowance all the way around the quilt, rounding each corner, leaving enough opening to fit your hand in. 3. Invert the whole sandwich to turn the quilt right side out. 4. Hand stitch the opening closed. 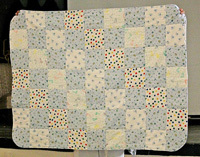 Keiko uses a 4.0 machine stitch in a generous meandering pattern to quilt. Again, any machine quilting is acceptable. If you can make some baby quilts for Keiko, please phone her at 310-390-3790. Keiko will arrange to pick up the quilts from you and will handle all shipping to Japan.